the money still belongs to the royalty company as it was never taken by the file sharer; it didn't belong to the aggrieved party to begin with, it was only agreed to be paid to them upon certain conditions. one hasn't even prevented the company from giving to the aggrieved, the preventing of which would be a demerit. there is really nothing i can even identify as inherently unwholesome about file sharing. Interesting thread, I'm definitely more weary of infringing copyright after reading it! However I cannot say I agree that it violates the precept on stealing - even if it is possibly unskillful as many have argued. He tends to fall on the side of the debate which says it is not stealing, but he also promotes open source software use and does not actually go as far as promoting copyright violation. Bhikkhu Sujato wrote: You’d think that it wouldn’t need stating, but evidently it does: Buddhism is about letting go, copyright is about holding on. Even if we can accept a case for certain forms of copyright in certain spheres of life, how should that apply to Buddhism? After all, Buddhism not merely survived, but flourished for thousands of years before copyright came on the picture. Perhaps some historical perspective is in order. The first question, which can be dealt with swiftly, is whether copying is stealing under the Buddhist precepts. The answer is no. Stealing in Buddhism requires that the owner be deprived of something. Copying is not taking. You could argue that the creator is indirectly deprived of income, but that is irrelevant. There are plenty of ways to indirectly deprive someone of income; I could set up a rival business, for example. I might even do that out of malice, to deliberately harm you. That may not be a nice thing to do, it might even be illegal, but it has nothing to do with stealing. Of course, breaking copyright is against the law, which is a separate matter; but it is not breaking precepts. Incidentally, many monastics, like most people in developing countries, use pirated software all the time. If copying was stealing, they’d risk falling into an expulsion offence. However, even though there is no expulsion offence for using the software, it is still often illegal. This is one of the many reasons why monastics should use Free and Open Source Software (FOSS), such as Linux. This also highlights one of the often-overlooked details of copyright history. Software is an unusual industry in that extensive copying has existed as long as the industry has. People have been using millions of pirated copies of Windows and other software as long as they have been around. Yet software companies are thriving, and making record profits. For the Buddhist tradition, as indeed for most ancient traditions, there is no notion of intellectual property. People borrowed and copied all the time. Buddhist texts are full of cases where monks or nuns are quoting verbatim passages from the Buddha or others, and there is never an issue of ownership. That’s because the Dhamma is not about ownership. It’s about helping people let go of suffering. 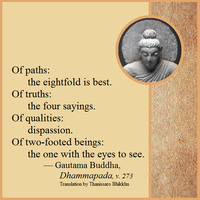 The Dhamma was felt to be, if anyone’s, the Buddha’s. The Buddha encouraged his students to teach the Dhamma in their own language; so that, from the earliest days, the Dhamma existed in multiple translated forms, all of which were considered to be the words of the Buddha. When the texts were later translated into Chinese and Tibetan, they continued this tradition, regarding these texts as “the word of the Buddha” in exactly the same sense as the “original” scriptures (which were themselves translations from one Indic dialect to another). However, in modern times agreements such as the Berne convention ruled that translations should be considered to be original creations. I think this is a mistake. I’ve done original writing, and I’ve done translations, and they are very different kinds of things. You can, for example, get a computer to do translation, albeit poorly, but no computer can write a meaningful original article. Ven. Thanissaro once mentioned in a Dhamma talk that even just thinking about someone without their permission constitutes stealing. It can sometimes be difficult to define whether a particular activity breaks a precept or not. But one can have a sense that a particular activity breaks the spirit of the precept. Which, for me, personally, suffices. When gifts are replaced by rights, so is gratitude replaced by claims. And claims breed resentment. Since you are queuing on equal terms with the competition, you will begin to think of the special conditions that entitle you to a greater, a speedier, or a more effective share. You will be always one step from the official complaint, the court action, the press interview, and the snarling reproach against Them, the ones who owed you this right and also withheld it. Agape, the contagious gentleness between people, survives only where there is a habit of giving. Take away gift, and agape gives way to the attitude that Nietzsche called ressentiment, the vigilant envy of others, and the desire to take from them what I but not they have a right to. And conversely, that gentleness between people does not develop if people take what has not been offered. It depends on the quality of interaction that one wants with others. If something is dinnaṃ, "given", it means either (1) nobody owns it or (2) Smith, the person who owns it, chooses to give it to Jones without any coercion or deception on Jones's part. If Smith doesn't choose to do so, then it's adinnaṃ, "not given", and therefore an improper thing for Jones to take. Where secular law comes into play is with regard to defining what counts as "owned" and "ownerless". This will vary from one society to another and one age to another, but whatever it happens to be when and where one is living must be accepted. For example, in the Buddha's time it was the custom for rag-robe-wearing bhikkhus to go into charnel grounds, remove the winding sheets from corpses and sew them into robes for themselves. This was a permitted practice because the laws of that time regarded the cloth on a corpse as ownerless. But as far as I know this is not generally the case today, and so if a bhikkhu went into a modern city morgue or funeral parlour, unwrapped the cloths from some corpses and then carried them away to use as robe-material, he would be taking what is adinnaṃ because such cloth is nowadays deemed to have an owner. Where secular law comes into play is with regard to defining what counts as "owned" and "ownerless". This will vary from one society to another and one age to another, but whatever it happens to be when and where one is living must be accepted. For example, in the Buddha's time it was the custom for rag-robe-wearing bhikkhus to go into charnel grounds, remove the winding sheets from corpses and sew them into robes for themselves. This was a permitted practice because the laws of that time regarded the cloth on a corpse as ownerless. But as far as I know this is not generally the case today, and so if a bhikkhu went into a modern city morgue or funeral parlour, unwrapped the cloths from some corpses and then carrying them away to use as robe-material, he would be taking what is adinnaṃ because such cloth is nowadays deemed to have an owner. what has not been let go of, what has not been relinquished; what is guarded, what is protected, what is regarded as “mine;” what belongs to someone else. obviously relates to copyrighted material and would seem to deal with Sovatthika's objection, and the points made by Sujato above. Software is jealously guarded and protected and regarded as subject to ownership according to legal convention. The answer is in the title of this thread: the fact that the downloading in question is illegal means that someone has taken the trouble to publicly register their ownership, guardianship, and protection of whatever is to be downloaded. Doesn't this give too much moral authority to the state over and above the Buddha's Dhamma? Let's say that I lived in a totalitarian state whose laws made it clear that the state owns all intellectual property, including the words of the Buddha (not a far fetched premise, given several 20th century events). By this logic, even reciting or writing down from memory and distributing Dhamma without state permission would constitute as breaking the precept and one can easily see that the state would take this interpretation on board against monastics who sought to distribute Dhamma without state sanction. Likewise as has been mentioned before there are other absurd conclusions from copyright law if we take it seriously, like not being able to sing the happy birthday song or a disney tune in public, etc. In a scenario like this, Buddhaghosa's qualification of the obligation to conform to the wishes of kings would come into effect. I allow you, monks, to obey kings – here it is permitted for a bhikkhu to obey [the king] because delayed entry into the rains retreat causes no decline for bhikkhus; therefore in regard to any other kind of righteous act (dhammika kamma) a bhikkhu should obey, but never in regard to an unrighteous one. I suspect that an underlying issue here is that there are or should be such things as "public goods", and that they aren't or shouldn't be limited to air or water. (However, even with air and water, the matter is far from settled, given the recent legislations around the world regarding the ownership of water and the responsibility for air pollution.) The idea seems to be that if something is as readily available as air, then taking it shouldn't be considered stealing. Many digital contents do seem "as readily available as air," which is probably why some people don't consider taking those digital contents to be an act of stealing. Agreed. The fact that someone has taken time to register ownership of digital content is the sign that we can't treat it as a "public good" without further investigation. The water issue is interesting. Where I live, I would laugh at someone who claims ownership of untreated water, but the purified stuff in tanks or bottles is another matter.